30 April 2018 – TRANSCEND Media Service* — “Uridu an aouda ela bayti fi Sourya!” (“I want to return home to Syria!”). During our meeting, the Patriarch donned what must have been perhaps 40 pounds of thick impressive bright colored robes, and a huge gold cross as he sat below a large painting of Jesus Christ. He had just arrived from a religious event and did not bother to change into something more layman-like. Most Palestinians who were forced from the war in Syria to Lebanon have returned and my friends from Yarmouk “camp” in Damascus, now nearly destroyed, all express how shocked they were to find the conditions their countrymen are forced to live under is Lebanon. Yet, like the Syrians still seeking refuge in Lebanon, most cannot return at this time for a variety of political and security reasons, some of which are noted below. Probably most of the Lebanese population approve because they are influenced by fear-mongering and anti-refugee campaign speeches. The latter are intensifying and becoming ever more strident with national elections less than two weeks away and politicians making the refugees a main ballot box issue. Lebanon’s Foreign Minister Jebran Bassil, who leads President Michel Aoun’s Free Patriotic Movement party and is the president’s son-in-law, has been stridently insisting since last January that it’s past time for all Syrian refugees to return home. He and other Christian politicians warn voters that the overwhelmingly Sunni Muslim Syrian refugee population is a threat to Lebanon’s national identity. Many Shia Muslim politicians tell their voters that there must not be more Sunni Muslims in Lebanon. To achieve this goal there continues to be evermore illegal civilian ethnic cleaning and population transfer schemes in the name of “reconciliation agreements” or “deconfliction zones”. Long story made short, if one supports the Assad regime (most Shias) the person wants the refugees seeking safety in Lebanon pushed back into Syria to face whatever is to be their fate. Even as donor nations raise money at the Brussels gathering for Syria’s neighbors to host refugees from the country’s civil war, a leading international rights group and the U.N.’s refugee agency claim that Lebanese authorities are evicting refugees from towns and camps in the country on questionable legal grounds. Some Syrian refugees have reported this week that if they ask for help from local officials to stop summary evictions they are being told, “Go back to Syria.” Human Rights Watch has documented evictions in 13 towns and villages putting more than 3,600 Syrians on the streets since 2016. It said the Lebanese Army uprooted another 7,500 refugees near a military base around Christmas 2017. Law 10 as it is commonly called, gives property owners both in Syria and abroad just 30 days—starting 4/11/2018—to present their deeds to local council offices in the country. Otherwise, the state can liquidate their titles and seize their holdings. Once the registration window closes, “the remaining plots will be sold at auction,” according to Article 31 of the law. Billions of dollars in real estate are expected to go to certain regime approved ‘investors’ while millions of Syrians, mainly Sunni, lose their property in Syria. 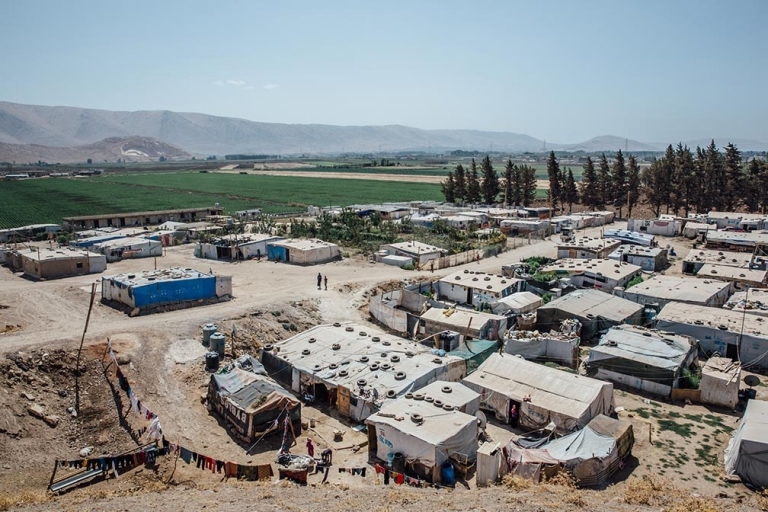 An estimated 5.7 million Syrians have fled the country as refugees, and a further 6.5 million people are displaced inside Syria, thus more than 12 million Syrian’s risk losing their homes. The UN estimates that only approximately 9 % of Syrians who fled the slaughter even have in their possession or access to documentation showing ownership. Most Syrian refugees lost them during the war. But there are many other barriers that await the 9%. The war is far from over as “defeated” militia and rebels regroup and launch asymmetrical and guerilla warfare that will likely last indefinitely until a new order is in place that grants the average Syrian citizen dignity, full civil rights, economic opportunities and participation in Syria’s local and national government. Intense military operations are ongoing in several regions, resulting in new waves of population displacements. Approximately one-quarter of Syrians live in exile and almost one-third has been internally displaced. Yet but their priorities are not being represented in the claimed “negotiations” over a postwar political settlement. The Geneva process and talks in Astana have focused on” stabilization” and “de-escalation” efforts, while largely ignoring the plight of refugees and internally displaced populations. *Franklin P. Lamb, LLB, LLM, Ph.D. is a Fellow at Oxford University-UK, Law Professor, Legal Adviser to the Sabra-Shatila Scholarship Program, Shatila Camp (SSSP-lb.com), and a member of the TRANSCEND Network for Peace Development Environment. As a volunteer with the Palestine Civil Rights Campaign, Beirut and Washington, DC he is committed to help achieving the Right to Work and the Right to Home Ownership for every Palestinian Refugee in Lebanon. Lamb’s recent book, Syria’s Endangered Heritage: An international Responsibility to Protect and Preserve, is available on Amazon and other ebook outlets as well as at www.syrian-heritage.com . For Syria Heritage updates, please visit: www.syrian-heritage.com. To provide a meal to a Syrian refugee child in Lebanon please visit: http://mealsforsyrianrefugeechildrenlebanon.com. Lamb is reachable c/o franklin.lamb@hmc.ox.ac.uk or fplamb@gmail.com. This article originally appeared on Transcend Media Service (TMS) on 30 Apr 2018: TMS: Lebanon’s Politicians Insist Syrian Refugees Return Home Now! But to What?